Strike Eagle 1-6x24 is rated 4.8 out of 5 by 359. Rated 5 out of 5 by WilliamColeWilson23 from Great scope for a good price! I bought this for an AR and have really enjoyed it, when sighting it in I was amazed at how tight my groups are. The different levels of brightness are great and love the BDC concept. Works great paired with a green light for hunting coyotes/hogs at night. To top it off It comes with flip up sights and I received a vortex cap with my order. Great scope for the price and does everything I was wanting, beats buying a red dot and magnifier in my opinion because this will do so much more. This being my first Vortex I couldn't believe the clarity of the glass and it made me a believer. Looking to put other Vortex optics on some other rifles I own. Rated 5 out of 5 by Jmurphr3 from Beautifully amazing scope I recently received this as a gift a few weeks ago. It's absolutely amazing! Crystal clear glass, comes with flip up covers for each end, and not too heavy. The Manu is short Sweet and straight to the point with how to tweak it. It has great eye relief. I've never had a good scope and always wondered how you use it with both eyes open. Well, this scope is one that allows you to do just that quite easily. Love the reticle too. You can see it during the day on the highest setting. Multiple fine settings for the lighting of the reticle. Overall you cannot go wrong with the strike eagle. Plus, can't beat a lifetime warranty! Rated 5 out of 5 by J.R. from Super great scope. I got into 3 gun this year and started off with a 4x scope that let's say did not hold to up expectations. It starting shaking loose from the recoil and wouldn't hold zero. I noticed so many others using vortex and decided to upgrade about 2 months ago. I am very pleased with the clarity and how light weight it is. It holds dead zero for me at 200 yards and very easy to use. For the price you cannot beat this scope. You will have trouble seeing out past 400 but not a big issue for 3 gun competitions. I would love to be sponsored by vortex and they have a great customer service team with the lifetime warranty on their products. Rated 4 out of 5 by Cwade from Good entry level This is a great scope for the entry level. Glass is clear enough for use at the range, or even 3 gun competition. Zoom level has great texture allowing for easy grip, and is smooth enough to adjust with ease. Weight is not that much of an issue. 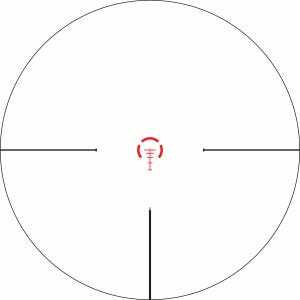 The reticle is easy to read, and use. The con I have with the scope is the glass in certain lighting will have a brownish hue to it, and some distortion on the edge of a field of view at max power. Overall is great scope to get started. Pros: - Cost - Easy to read reticle - Weight - Illumination is good enough in low light and overcast days Cons: - Glass has a brown hue in certain lighting - Illumination washes out in bright day light. Rated 5 out of 5 by Wmax from Great scope! I bought this to put on a 16" 5.56 AR that I use for deer, coyotes, and fun shooting. Mounted it using a LaRue mount so that I could swap it out for a 3x9 if need be. I got rid of a red dot and think the Strike Eagle will end up doing what both the red dot and the 3x9 did except in one package. The scope works well enough in low light that I don't use the lighted function as much as I though I would. The lighted reticle works well on darker targets and should be very nice for hogs. I shot a couple of 1" groups at 100yds and then rang the 8" gong at 300yds until it got boring. The hold over lines work great for that. Rated 4 out of 5 by Danny216 from fanrastic optic priced lower than it should be! I bought the Strike Eagle about 3 months ago for 3 gun. Right away I was impressed with it. I was somewhat skeptical of what could be considered a "budget optic," but I had read enough reviews to think it was worth a shot. The scope is much more "solid" than other scopes in its price range. 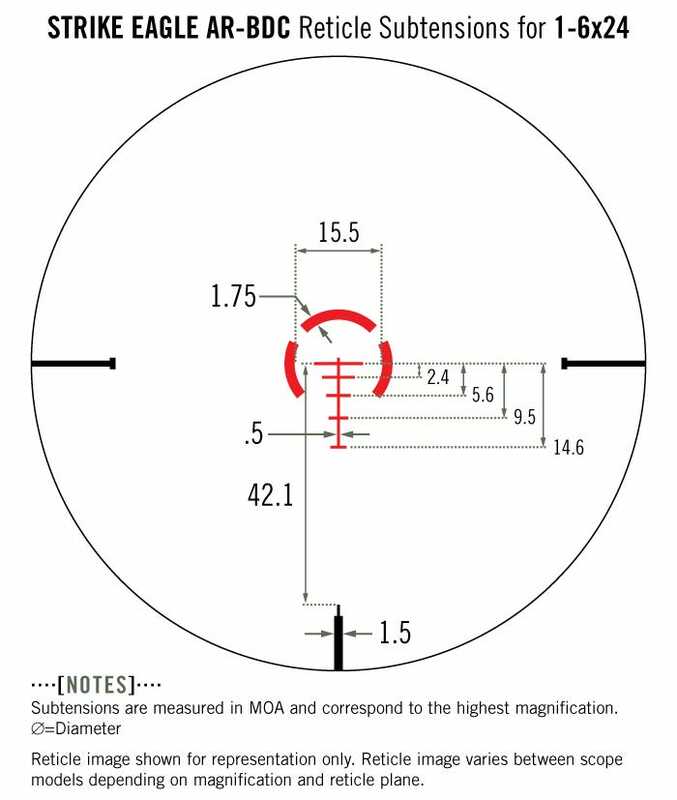 The sturdy metal construction of the scope and the positive clicks of the the elevation and wind age knobs aren't typical of other scopes in this class. The illuminated reticle took some getting used to, but after a few hundred rounds I was using it like a red dot up close and dialing it up for distance in no time. It's a great do-it-all optic offering up close speed and distance precision. Rated 4 out of 5 by Magilla from Perfect AR platform scope I was a cop for 25 years, I was issued an M4 for 14 years, with a Leupold MK4 C/QT scope. After retirement, I was allowed to purchase the rifle without the scope. I chose the Strike Eagle as a replacement, and am totally satisfied. The optics are very clear, and I really like the ETCHED & ILLUMINATED reticle. The Vortex scope is superior to the Leupold in all aspects. For the price, I could not find a scope anywhere near the quality with similar features. My only critique is that the turret adjustment could be crisper, more positive. The turret knobs are good, but not perfect. Rated 5 out of 5 by Matt from TX from Strike Eagle is a home run Wow, where to start. The Strike Eagle is an amazing do-it-all, short- to medium-range scope. I've had it on an AR and it's now sitting in low 30mm rings on a suppressed Ruger 10/22. Both platforms shine with this scope sitting on top. Construction is first-rate, as is the glass. The reticle is necessarily busy but it works, and the illumination settings are well designed. Depending on the platform you run this on, the weight may or may not come into play. At about 17oz it's not a featherweight, but it's not a lead brick either. I'm very, very pleased with the Strike Eagle. Very well made, very versatile and a purchase that I don't regret in the least.